Ahead of Turkey’s historic election, Kader Sevinç fielded questıons from Vincent Georis of L’Echo, a leading Belgian daily. Sevinç discussed at length Turkey’s economy, EU accession and the opposition’s prospects. “There is pressure applied to economists and analysts by the AKP and their bosses to turn a blind eye to negative developments. Nevertheless, Turkish people are aware of the fact that the economic troubles are so severe and majority of Turkish companies are on their knees,” she said. Please find below full English transcript and link to the original interview in French. 1) Is there any hope for those elections, or will Erdogan win in any case? More than hope, I have no doubt that we will win. Please note that it’s not “wishful thinking”, but the fact. Polls conducted by reliable companies demonstrate that, Erdogan’s ruling party and its nationalist ally seem to lose the parliamentary majority to “Nation Alliance” forged by four opposition parties led by CHP. The opposition parties garner 43 percent of the votes while ruling AKP-MHP (nationalist pseudo opposition party) alliance only captures 42 percent of the votes. Regarding the presidential elections, at first, we were counting on carrying the presidential race to the second round. But now, apparently everything has changed. Now, I am sure that CHP’s candidate Ince will win. Honestly I have been engaged in politics for several years, I have never seen such a spirit of change in Turkey. 2) What’s the main issue of the campaign? The economic downturn is one of the most problematic chink in Turkey’s armor. The Turkish lira, which traded at 2.15 to the dollar during the previous presidential election in 2014, sank precipitously, hitting 4.75 today in the financial markets. That’s why Erdoğan decided to call national elections 2 years ahead of time so that the ballots would be cast before the feared economic crisis hits full-force. The real question is how much this crisis will affect voters’ behavior now. Turkish citizens are kept in absolute dark about true economic developments. There is a pressure applied to economists and analysts by AKP and their own bosses to turn a blind eye to negative developments. Nevertheless Turkish people is aware of the fact that the economic troubles are very severe and majority of companies of Turkey are on their knees. The CHP’s manifesto offers concrete and holistic promises, including a wide range of social reforms, economic remedies and development policies. Supporting disadvantaged groups and youth with a progressive vision, bringing social justice back, upgrading our education system, reform of the pension system and restoring confidence in the judiciary. We will have a period of renovations and adjustments ahead of us to make Turkey a strong democracy and socio-economic system. 3) How will the Turkish community vote in Belgium? Almost one and a half million Turkish citizens who have registered in the foreign electoral roll voted in Turkey’s upcoming elections in 60 countries as of yesterday. The foreign vote represents nearly 5 percent of the total. Turks abroad casted their votes between June 15-19 in two polling stations in Belgium. I expect in both of the parliamentary and presidential elections, the CHP’s our candidate Ince take the lead in the second round. Other opposition parties already pledged their support to the candidate who goes to the second round. We will bring a different perspective to the Turkish diaspora too. We are determined to fulfill our promises reflected in our party program to the Turkish diaspora, not as an opposition party, but at a ruling party. They will experience a government that treats all of them as equal citizens of Turkey, and we will encourage the integration of Turkish communities in their resident countries in Europe. Our principle is clear: peace at home, peace in the world. 4) Who’s Muharrem Ince, CHP Candidate? 54 year old presidential candidate Muharrem Ince studied physics and chemistry at university. He worked as a teacher in the early years of his career. He was a deputy for 16 years in his hometown of Yalova, and took various leadership roles, including CHP deputy group leader. His speeches against the AKP and Erdoğan’s anti-democratic policies went viral among his 3.6 million Twitter followers and similarly on Facebook and other social media channels. He is regarded as a charismatic and resilient politician who is very much welcomed by conservatives and other demographics beyond CHP’s usual voting base. Ince promises to take ‘bold and courageous” steps to solve the Kurdish issue. During the campaign he has visited HDP’s imprisoned presidential candidate Demirtaş. Stood against lifting immunities and imprisonment. As a progressive candidate Mr Ince may also have great support from voters in eastern Turkey. 5) Does he have any chance to succeed? Let me ask you that question. On one side, there is someone who is tired and on the other side, there is someone new and energetic. On one side, there is someone who has been unable to solve the Turkey’s problems for 16 years, and on the other side, there is someone who gives hope and generates optimism based on concrete projects and ideas for a a better future for all. On one side there is a rusty mentality, and on the other side, a novelty. Who would you support? I believe in the wisdom and common sense of Turkish people, of young generations. Our motto is simple and cheerful: “we will win, we will win, and we will win”! 6) What will be his first decision(s)? No one has life and property security in Turkey now. The property of anyone can be confiscated with just one decree law. Civil society and business leaders can be detained, and let’s not forget, our prisons are unfortunately full of them already. That’s why we promise to lift the persisting state of emergency in 48 hours after our presidential candidate Muharrem Ince takes the office as the president in a clear message to the world that the new government prioritizes democracy. In addition to this we promise to establish an independent, impartial and fair justice system in the first place. He pledges to maintain the rule of law in the first place too. Then the economic policies such as ensuring the independence of the Central Bank and un-politicization of the economic administration after many years of politicization. On the top of all he pledges to bring back peace and confidence to our societal life. His and CHP’s concrete projects, roadmaps promises prosperity, and jobs to the Turkish people. We will make Turkish society happy again. 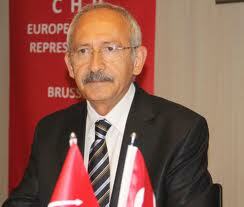 7) What will you do, Kader Sevinc, in case of the CHP candidate wins? I have been representing the CHP, Turkey’s progressive voice for many years in Europe. I have been investing time and energy here in Brussels on future of Europe and Turkey’s EU accession since I started working in and with the EU institutions. Before I was doing the same back in Turkey as an activist and researcher. I wholeheartedly believe in the integration goal. I believe in the bright future of Turkey and potential of young generation Turks. I believe in my country and its transformation into a full-fledged democracy. Such a country would definitely contribute a lot to the European Union too. I am so happy taking an active role from policy development to communications in this election campaign, which in my judgement is the key to changing the destiny of Turkey and have the potential to make a positive impact on Europe too. After the elections in any capacity I feel that I will be make an impact, I will keep contributing and leading on all efforts that would progress my country to the next level. There is one thing for sure, you will be hearing more in Europe from progressive Turks and our successes in transforming our country for better in every possible aspects. 8) What would be the best result for the future of the EU-Turkey relationship? Restoring the weakened relations with EU-based countries and renewing membership perspective should be the primary foreign policy topic after the elections. The EU accession process should be considered as a non-partisan topic not just for Turkey but for all candidate countries. When the Erdogan’s government forget this fact and began to serve it as a partisan issue, reforms were executed on a selective point of view, and consequently the EU membership is deadlocked. We must note that European leaders didn’t play a constructive role by ignoring warnings from civil society and opposition very early on and blocking politically the negotiation chapters, even the ones on fundamental rights. For a start, Turkey must do its homework. A committee must be set up to follow the EU membership process as Croatia did, with a chair always from the opposition parties. We can achieve this if Diplomacy 4.0 is adopted, and the polarization within the country is resolved. In the context of EU reforms, the iotas on our agenda is to re-establish Turkey’s full membership in a strong and determined manner with a progressive vision. Without expecting first steps from the EU, I believe that Turkey will take initiative by introducing required policy reforms in many fields as part of CHP’s democratization program. For the sake of economic and social prosperity, we intend to revive the negotiations on the topics of visa liberalization, agricultural support funds and scientific cooperation and consider this a high-priority target. 9) Is there any future for this relationship if Erdogan wins? We will win. However the current state of things in relations deserves to be assessed. Turkey still officially aims to join the EU. Even our rival Erdoğan said it, in an election campaign speech last month. However to revive democracy and bring your country closer to the EU, the one must have a strong democratic credentials. He doesn’t have a very positive record, especially in the last 10 years. For example Turkey “continues to take huge strides away from the EU, in particular in the areas of rule of law and fundamental rights”, the commission also said in its report in April. In contrast to the government that is spreading ‘anti-European’ messages to the Turkish diaspora in Europe for instance: “not being integrated” and “Europeans being nazis”, CHP is determined to make the required reforms not just for EU membership but for the welfare of our citizens in the first place and work for a better Europe. We are Europeans and we see Europe’s future as our future too. 10) Does Gülen still have the means of pressure on these elections? This is a baseless propaganda that’s spread by the government. It’s one of the delusive policies of the Erdoğan, leveraged in his campaign to affect the conservative votes. After the failed coup in 2016, which saw Erdoğan jail over 150,000 people, including 192 journalists.